Losing a friend is always difficult, but sharing memories of these special companion animals or friends of animals can help us heal and guarantee that their love is never forgotten. Each memorial page honors a special animal or human and gives you the chance to make a unique memorial gift. After you create your page, it'll immediately be available online. You can then access the Memorial Center to customize your memorial or create and send e-mails to your friends and family. Love knows no bounds, and true friends come in many forms. You can create a page for any dog, cat, other animal, or human who was a true friend. Make a gift in memory of a human or an animal who doesn't have an online True Friends Memorial. 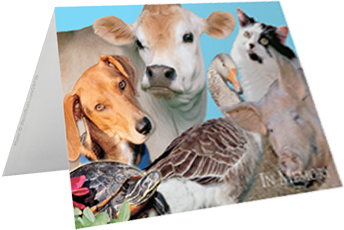 For any memorial donation of $20 or more, PETA will gladly send a memorial card to a bereaved friend or loved one. Please contact our True Friends coordinator at 757-213-8750 to arrange for this touching and beautiful card to be sent.